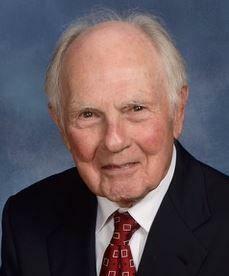 Charles Russell “Chuck” Ball who died March 4, 2019, at Marin General Hospital, was a man of few words and great achievements. He would say his greatest accomplishment was convincing his wife of 67 years, Cathy (d. Oct 2013), to marry him. He was also proud of their five children. Born in Long Beach, CA in 1926, he was the son of Ruth and Chuck Ball who met in the oil fields of southern California. The family moved to Bakersfield where he was later to follow in his parents’ footsteps spending a distinguished 40-year career in the international oil and gas business. He then retired, moved to his next career in the Napa Valley wine business and played a major role in fundraising for church and the arts. In his Bakersfield youth he not only was his high school band’s drummer, he also, in the early war years, became the chief percussionist of the Bakersfield Symphony Orchestra. Graduating at 16, he was invited to join the Navy’s elite V-12 college training program which sent him to study engineering at the University of Kansas. There he met and married Cathy Piller. Although WW-2 had ended when he graduated, he chose to do his naval service then and upon discharge returned to Bakersfield and the oil business. He soon spent six months in the nascent oil business of Kuwait before returning to California (then still an important oil province). He also pioneered offshore oil development in Peru in the late 1950s. Santa Fe International lured him to return to the world scene and sent him to London in 1961 to manage and grow their Middle East business. In London, he also became one of the founders of the significant new North Sea oil & gas province, both bringing in new technology as a drilling contractor and, with his small team, inspiring the discovery of the early major Thistle Field. His international career continued to produce firsts and breakthroughs and won him warm business and personal relationships in stints in Singapore, Indonesia, London – several times – and finally South China, where the efforts of his team marketing gas from the offshore Yacheng-13-1 gas field paved the way for the modern gas business in China. In 1987, he retired from oil & gas and moved to the Napa valley to found the boutique Oakford Vineyards label whose grapes he grew in a sweet spot of the Oakville slopes surrounded by the luminary vineyards of Far Niente, Mondavi and Harlan. He and Cathy were also key fundraisers and leaders in their church, the arts and Copia; Chuck also served as president of the successful effort to restore the Napa Valley Opera House. On a personal level, he volunteered to improve the lives of the Valley’s migrant community with English lessons and assistance with citizenship. Cathy and Chuck spent 5 years in Kansas City before returning to the valley in 2012. Chuck Ball is survived by 5 children: Susan, James (Skip), Andy, Sally and Linda; eight grand children, one great grandchild and 19 nephews and nieces. His sister Betty predeceased him. His funeral service will take place at Grace Episcopal Church, in St Helena CA on May 11. Military Honors and Flag Ceremony: 12:45; Funeral: 1:00pm. There's still time to send flowers to the Funeral Service at the Grace Episcopal Church at 1:00 PM on May 11, 2019.